Where do I begin to explain what this Dog meant to me, yes meant, Max died a few months ago. He died very suddenly and I miss him so. In 2012 I will be getting another male puppy from the same breeders. Max was a wonderful dog, he was playful and had the best personality. He was 4 yrs old when he passed. My female, who had been with him the entire time sure misses him too. I loved that dog, my…. do we get attached to our dogs! He was definitely part of the family. Another unique thing about him; was that he weighed 156lbs a month before he passed away, according to the Vet. After checking on Yahoo, the largest Shepherd recorded was 160 lbs. He was my best friend. This is a tribute to him. Either way he is my GSD of the Month! I know the pain you have of losing you beloved Max. Your heart aches for him, and you may shed a tear or two when you think of him and that's ok but then think of something that he as done and then you will smile. 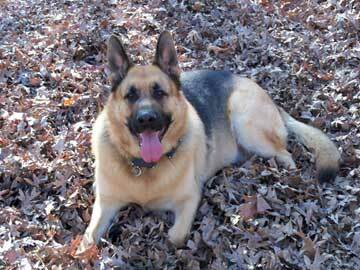 God must have wanted a German Shepherd to protect his Angels and thought Max was the BEST for that job! I lost my beloved Ebony my Black Lab and I know that ache in your heart. God sent me my German Shepherd MIA, 2 weeks later. Please read our story in total-german-shepherd, puppy Mia's story, Mia my beautiful german shepherd dog. Max will always be in your Heart, God Bless Max!!! by: Lt. Ronald McCarty Sr. Ret. Lisa Aguon, Max is now in HEAVON awaiting the day you pass on to him. But beware, Max lives in your heart and he will be with you picking out that new GSD puppy and listening to what you tell the puppy about him. Max has joined my Molly (GSD), my Stanley (GSD), my Morphy (GSD), my PRINCESS (17y11m GSD), my Pepper (LAB) and my Pooh (Cat) in Heavon. It doesn't get any easier but the rewards to stay faithful will be realized. Remember, you loved Max but I'll bet Max loved you more. Thanks for your story and God Bless Max who is where we will all be someday.